The global electronics industry, which encompasses military and automotive electronics, computers, business equipment and consumer electronics has evolved into a market that is now in excess of $1.5 T a year. The boon in personal wireless electronics including cell phones, tablets, laptops, remote control devices, headsets, speakers, etc. is helping fuel this staggering growth. This, in turn, is driving accelerated growth in fields that employ soft magnetic alloys for applications in oscillators and narrow bandpass filters, quadrupole magnet assemblies, cores for instrument transformers, magnetic shields, alternating current motors, generators, solenoids, transformers and electromagnetic pumps. The ferromagnetic alloys used for many of these applications are Fe-Ni and Fe-Co based alloys, fabricated into various laminated or bulk structures. The fabrication and processing of these eclectic materials is critical for their ultimate performance in the intended applications. where H is defined as the magnetic field strength or magnetizing force and B is the magnetic flux density or magnetic induction in the material. The constitutive variable μ represents the permeability, a material constant that expresses how responsive the material is to an applied magnetic field. For the case of a soft magnetic material, the permeability is a large positive number so that the presence of the magnetic material enhances the magnetic flux. In ferromagnetic materials, the spins of unfilled electron d-orbitals exhibit spontaneous parallel alignment below the Curie temperature (Tc) within microscopic domains, sometimes called Weiss domains, which are not necessarily coincident with crystallographic grain boundaries in the material, even without application of an external magnetic field. Specifically, the individual domains are magnetized to saturation. However, the spin direction and resultant magnetic moment within each domain is different, so that the individual magnetic moments for the material as a whole cancel each other and the net magnetization is zero. Application of a modest external magnetic field causes those domains whose moments are parallel, or nearly parallel to the external field, to grow at the expense of the unfavorably aligned domains. 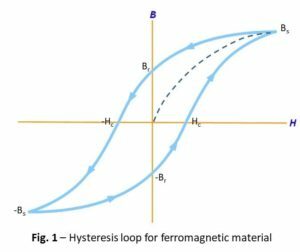 For a ferromagnetic material that has never been previously magnetized, the hysteresis curve will follow the dashed line in Figure 1 as the magnetic field strength, H, is increased. As the magnetic field strength is increased, the magnetic induction rises more rapidly until its magnitude levels off at a maximum value, referred to as the saturation induction, Bs. This behavior results when the magnetic moments within unfavorably aligned domains rotate closer to the direction of the applied field, until finally all moments within all domains are aligned as close as possible to the field direction. If the magnetic field, H, is then removed (i.e. returned to zero), the magnitude of the induction drops off but displays a non-zero value in the absence of the applied field. Some magnetic flux remains in the material even though the magnetizing force is zero. This is referred to as the retentivity, or the level of residual flux density in the material (Br). At this point, some of the magnetic domains have remained aligned, while others are not. Ferromagnetic materials that display low retentivity are ideal for use in electromagnets, solenoids or relays, since they can be easily magnetized and demagnetized. As the applied magnetic field is increased in the negative direction, a point is reached where the magnetic flux density is zero. The force required to remove the magnetic induction is called the coercive force or coercivity (Hc). As the magnitude of the reverse field is increased, the material will again saturate at a value of -Bs. As before, a remnant induction remains when the applied field is reduced back to zero. When the externally applied magnetic field is cycled back and forth in this manner, the B-H behavior of the material follows a curve that is described by the technical hysteresis loop. The property of hysteresis in ferromagnetic materials is a direct result of the fact that real materials contain defects. Defects can be characterized as grain boundaries, inclusions, second phase precipitates, dislocations, stacking faults, vacancies and impurities. In essence, a defect is anything that disrupts the regular atomic order of a crystalline material resulting in local stress and strain in the lattice. Because of the presence of defects, domain wall (Bloch wall) movement in response to an applied magnetic field is not smooth and continuous. The pinning effect of localized stress fields in the crystal lattice of the material causes the Bloch walls to move in little jerks, which causes the induction to increase or decrease in a discontinuous manner. The Bloch walls get stuck once in a while and then suddenly surge forward. This process sets up eddy currents and sound waves (Barkhausen effect), which consume energy. Since energy is consumed, the process is thermodynamically irreversible. Hence, the area inside the B–H loop defines the hysteresis loss in the system. The selection of a particular ferromagnetic alloy is important for the design and optimal performance of the resulting device. Applications that target Fe-Ni and Fe-Co alloys generally require high magnetic permeability, high saturation induction, low coercivity, low hysteresis and eddy current loss, and high electrical resistivity. High magnetic permeability and saturation induction foster high flux density in the material with low excitation current, thereby maximizing device efficiency. Low coercivity and low remnant induction dictate a narrow hysteresis loop, which minimizes energy losses. And moderately high electrical resistivity helps suppress eddy currents that result from discontinuous Bloch wall movement. In turn, these properties can be segregated into two general categories, those that are microstructure sensitive and those that are not. Microstructure insensitive properties are not appreciably affected by small changes in overall alloy composition, defect density, or processing history. These include saturation induction (Bs), Curie temperature (Tc) and electrical resistivity. By contrast, microstructure sensitive properties can be drastically affected by minor changes in alloy composition, type and density of defects, and manufacturing process history. The microstructure sensitive ferromagnetic properties are permeability (μ), coercivity (Hc), remnant induction (Br), and hysteresis loss. The technological procedures for controlling microstructure sensitive properties are alloy melt processing and post fabrication heat treatment.